To provide the highest quality jewelry, expert repair, custom design and excellent customer service in a warm, family-friendly environment. Since 1982, Sam Falls has followed his dream of having a full-service jewelry store in downtown Kannapolis. Sam’s father, Don, and his grandfather, Herbert, were jewelers in Kannapolis, which led Sam to develop his passion for the jewelry industry at a young age. 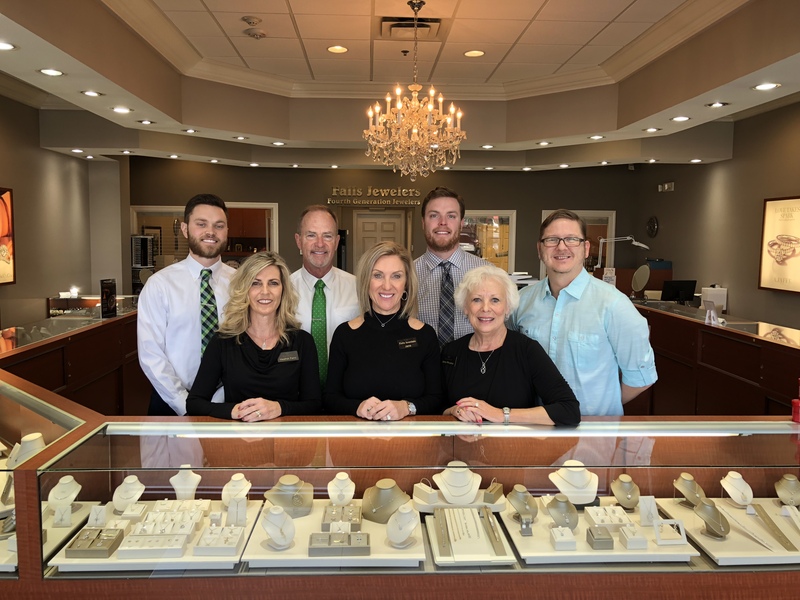 In 1990, after eight years of extensive training in jewelry repair and custom design, Sam and Jane Falls opened the doors of Falls Jewelers in historic Cannon Village located in Kannapolis. After twenty years in downtown, Falls Jewelers relocated to Afton Ridge off of Kannapolis Parkway where we are currently located (6177 Bayfield Parkway Concord, NC 28027). In 2008, John Watts added his expertise as a bench jeweler to the staff here at Falls Jewelers. He has now worked with the Falls team for nearly 10 years and has spent more than 25 years perfecting his craft as a bench jeweler. John is certified in laser welding and specializes in doing all types of jewelry repair (ring sizing, stone setting, soldering, engraving, etc.) and also all types of custom work as well. He performs all of his work in-house and does a phenominal job. In 2014, Sam and Jane's oldest son, Spencer, began working on the Falls Jewelers team as a part-time employee. He received a Business Management degree from UNC Charlotte in 2015 and became full-time after he graduated. In 2017, Sam and Jane's youngest son, Caleb, also joined the Falls Jewelers staff as a full-time employee. He received a degree in Advertising and Marketing from UNC Chapel Hill. He is now the Social Media and Marketing Manager and a Sales Associate for Falls Jewelers, while his brother, Spencer, is the Inventory Manager as well as a Sales Associate here at Falls. Jane Rhodes and Heather Ferro are also a part of the Falls Jewelers team. Both of these ladies are Sales Associates for us here at Falls and do a wonderful job providing excellent customer service. Whether it’s a simple repair, a custom design of a special ring for you, or a beautiful diamond hand-picked for you directly from Antwerp, Belgium, the staff here at Falls Jewelers is committed to providing the beautiful jewelry you want at a great value. We invite you to come check out our fourth generation jewelry store, and we always greatly appreciate your business.